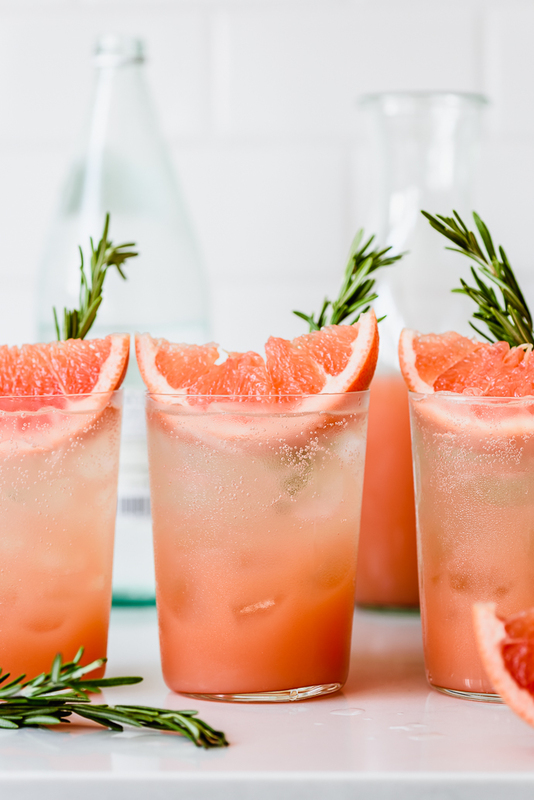 Tart and fizzy honey rosemary grapefruit sodas combine a sweet and herbaceous rosemary simple syrup with fresh grapefruit juice and pure honey for a flavorful, naturally-sweetened homemade soda you’ll want to sip on all Summer long. Heat the water, sugar, honey, and grapefruit juice in a medium sauce pan over medium heat, stirring occasionally, until the sugar is dissolved, about 5 minutes. Add the grapefruit zest and rosemary, and let gently simmer for another 5 minutes. Remove from the heat, and steep for up to an hour. Strain through a fine-mesh sieve into a glass jar, and chill before serving. Can be made in advance, and stored in the refrigerator for about a week. To serve, fill a highball glass with ice. Add the rosemary simple syrup and fresh grapefruit juice. Stir to combine. Top with soda/sparkling water.